There are a couple of good reasons for backing up your user customization files which hold your settings for books and charts, screens and windows, color schemes as well timeline customizations, etc. This is good information if you need to do a clean re-installation of Legacy, which will require completely removing your Legacy program; or if you want to install Legacy on a another computer; or if you lose settings when you update Legacy. You will be able to quickly restore your settings or transfer them to the other computer. 1. To begin, open your Documents folder and browse into the Legacy Family Tree sub-directory. Next, right-click on the _AppData folder and a popup menu will appear. 2. Click on Send to on the menu. 3. Then click on Compressed (zipped) folder and a zipped backup folder will be created that holds all of your settings for books, reports, screens, color schemes as well timeline customizations. To extract the _AppData folder from your backup, please visit http://windows.microsoft.com/en-us/windows/compress-uncompress-files-zip-files#1TC=windows-7 to see a free video demonstration. 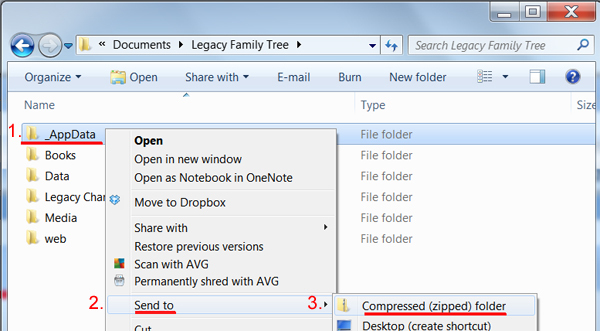 The _AppData folder should be restored to the Legacy Family Tree folder in your Documents.